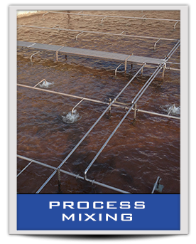 EnviroMix’s innovative technologies harness the power of large bubbles for highly energy efficient complete mixing. Using short, powerful bursts of compressed gas through engineered nozzles affixed to the floor of the channel, tank, digester, or reactor, these large bubbles lift and roll fluids, blending the contents. 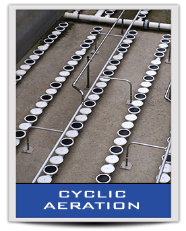 By decoupling aeration from mixing, both can be much more efficient – and that saves money! Due to the large diameter bubbles produced with BioMix and the resulting, low bubble surface area to air volume ration, the amount of oxygen transferred with BioMix is negligible. 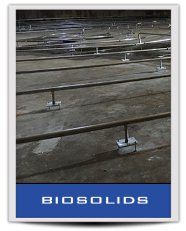 This makes BioMix ideally suited for the anoxic and anaerobic mixing associated with Biological Nutrient Removal (BNR) applications. Depending upon the application, the compressed gas may be air, nitrogen or digester gas. EnviroMix systems are ideal for wastewater treatment chambers (aerobic, anoxic and anaerobic), open channels, equalization tanks, and digesters, both anaerobic and aerobic. Moreover EnviroMix systems are equally well suited for water treatment applications, such as flocculation basins, disinfection chambers, and treated water storage. The systems can also be ideal for many industrial mixing applications. Electrical power requirements are limited to the power required to produce the compressed gas source (blower or compressor) and the human machine interface (HMI) controllers in the EnviroMix control panels.